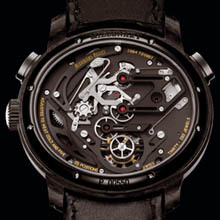 The Millenary Carbon One has emerged straight from Audemars Piguet’s cutting-edge research laboratory. This special development unit combines the finest talents – engineers, designers and watchmakers – from both of the company’s production sites in Le Brassus and Le Locle. Its mission consists in exploring advanced technical paths in order to ensure 100% in-house conception, prototype creation and production of exclusive movements that are a perfect match for their exterior. The Millenary Carbon One, a limited series of 120 watches, has just emerged from this hotbed of creativity. It is freely inspired by motor sports and their extraordinary ultra-light high-performance speed machines, while adopting the oval shape of the Millenary as a spectacular playground. Its key strengths include a three-dimensional design, innovative materials, and a 100% proprietary movement equipped with a tourbillon, a chronograph and a 10-day power reserve. The Millenary Carbon One embodies the pursuit of research into three-dimensional design that began several years ago with the Tradition d’Excellence N°5, the Millenary with deadbeat seconds, or the classic Jules Audemars Chronometer with Audemars Piguet escapement. In this instance, the aim was to enrich this exploration by making use of new materials. Three-dimensional design aims to move beyond the classic opposition between outside and inside, between the interior of the watch – its movement – and the exterior – meaning the case and the dial with its multiple displays. Thanks to the openworked dial, the Millenary Carbon One clearly reveals the manner in which its parts are layered on various levels. 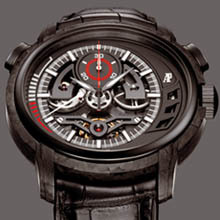 It shows a calibre featuring a modern design that plays on symmetrical effects such as between the barrels and their bridges on either side of the chronograph counter; on redesigned shapes such as the tourbillon bridge; and on materials. The latter focus on black, with blackened steel for the bridges on the dial side, eloxed aluminium for the bridges on the underside and carbon for the mainplate. This is however a very special carbon, an isotropic material composed of carbon nanofibres injected at an extremely high pressure of 7500 N/cm2 and at a temperature of 2400°C in order to achieve a material boasting mechanical, physical and chemical stability in all directions. This amorphous and chemically neutral composite material maintains its dimensions over a broad range of temperatures. Due to its absolutely minimal elastic deformation, this carbon also features exceptional mechanical properties well suited to driving in metal elements, such as the foot screws in the body of the mainplate. Once in place, these components thus guarantee optimal stability. Guided by a concern to achieve consistency and continuity, black high-tech materials are also used for the watch exterior. The case is in forged carbon, an ultra-light and resistant material exclusively developed by Audemars Piguet, from the manufacturing method through to the related tools. The sophisticated shapes of the Millenary are achieved thanks to an appropriate mould. A set of threaded carbon filaments is placed inside this mould. This wire measuring just one millimetre in diameter is itself composed of several thousand 7-micron carbon fibres held together by a resin wire. The case middle of the Millenary Carbone One calls for a set of filaments totalling 12.7 grammes. Placed end to end, these filaments are equivalent to 22.7 metres of carbon wire and 102.2 km of carbon fibres ! The mould is then compressed at high temperature at pressures of over 300 kilos per square centimetre. This process results in a material composed of 76% carbon and only 24% polyamide. Its exceptional hardness of 626 Vickers can be compared with the 420 Vickers score for alacrite, already a highly resistant material. The case middle and lugs are made all of a piece. Audemars Piguet than displays the full force of its expertise in the machining process. The inside of the case and the correction of the various drilled holes can thus be meticulously finished. The result is a silky feel with softly rounded shapes for a sturdy yet ultra-light case: the Millenary Carbon One weights just 69.44 grams! The bezel, crown and pushers are in ceramics, with a shiny black appearance that stands out beautifully against the matt shade of the forged carbon. The blackened steel on the case-back and AP folding clasp on the strap adds another interesting visual contribution. Rarely has a palette of black shades been so subtle, magnifying the white and red accents of the hour-markers, hands, chronograph counter and power-reserve display that ensure optimal readability and enliven the dial of this extremely exclusive limited series. Thanks to this plunging view of the movement and to the choice of materials, the predominant impression is black, sporty and high-tech, with a few touches of white and red that are distinctly reminiscent of racing car dashboard instruments. In another nod to the automobile world, the offset grid on the subdial at 3 o’clock evokes ventilation ducts and is a component in its own right, which means the dial has to be made in several parts. The Millenary Carbon One is intended for connoisseurs of Haute Horlogerie with a decided taste for fine mechanical engineering and who like to remain in the forefront of design, at the exact place where the exterior and the movement meet and merge, and where aesthetic and technical factors blend into a unified whole. Audemars Piguet Calibre 2884 is an oval hand-wound movement entirely developed and crafted by AP. It is a complex movement equipped with a tourbillon, an ultra-efficient column-wheel chronograph mechanism and twin barrels. Each movement is first assembled on a trial basis in order to set it into motion. This stage alone calls for ten full days of painstaking adjustments. Once the watchmaker is sure that it runs completely smoothly, he takes it apart and scrupulously cleans the parts before final assembly and casing up. It takes about 15 days to create a finished movement that then undergoes various tests. The role of the tourbillon is to enhance timekeeping accuracy by enclosing the escapement organs – the wheel, pallet and balance – inside a mobile carriage. This ensures that all parts continually change position, thereby compensating for the variations in rate induced by the effects of gravity. The 80-part tourbillon of the Millenary Carbon One is fixed to a blackened steel bridge with an entirely reworked design. Out of the 15 days required for assembly, three are devoted to the tourbillon and its rating adjustments. Mounted on an aluminium base and specifically built to match the dimensions of the oval case of the Millenary, the chronograph mechanism comprises an extremely efficient coupling lever. Apart from its tip which is contact with the column wheel, the lever is entirely machined in black PVD-coated nickel. It enables double adjustment, thereby guaranteeing enhanced precision and avoiding any jerking of the chronograph hand when the function is activated. The position of the chronograph push-button adds to the originality and sporting character of this watch that resembles a stop watch. The chronograph is stopped and started by the push-button at 10 o’clock, and reset by the one at 2 o’clock. Assembling the chronograph calls for particular care, especially when it comes to final adjustment and synchronisation that ensures the smooth Start/Stop/Reset sequence. Since synchronisation is done entirely by hand using eccentric parts, the process can easily go wrong and entail the replacement of various parts. Moreover, the column wheel can be easily admired through the back of the watch which is fitted with a sapphire crystal pane, thereby also providing a chance to get a closer look at the skilfully cut black eloxed aluminium bridges and the elegant finishing featuring alternating polished and brushed surfaces. The primary function of the barrel is to store up the mechanical energy required to ensure regular running of the movement. This energy is initially provided by manual winding. The crown on this model is fitted with a torque-restricting device that avoids excess strain during the winding process. The Millenary Carbon One is equipped with two parallel-coupled barrels ensuring an exceptional 10-day power reserve. The latter is read off on a red and white indicator positioned on the left of the dial. This rapid-rotation twin-barrel system – with a maximum number of revolutions restricted to 19.75 – guarantees constant force during the full ten days of autonomy, thus resulting in enhanced efficiency and improved timekeeping. The available power reserve actually amounts to 12 twelve days, but an ingenious locking system concentrates the watch operation on the ten days with the most regular running. The barrels play a considerable role in aesthetic terms. Adorned with the prestigious Audemars Piguet signature, they appear in the very depths of the mechanism through the dial, at the heart of the movement, thereby accentuating the three-dimensional effect. 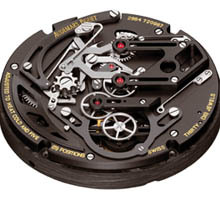 The same goes for the carbon mainplate which can be glimpsed on an even lower level of the layered movement. The Millenary Carbon One thereby perfectly integrates form and content. Calibre 2884 guarantees peerless performance, while the generous space provided by the oval shape of the case creates a spectacular stage-setting for the movement which is visible from both sides and thus becomes an integral part of the design.